One of the ways, I "redeemed" Christi's frequent flying miles after she died was by purchasing magazines for the two Ronald McDonald Houses we lived in, and also by ordering some subscriptions for family and Eric. For myself, I ordered "Glamour" magazine - a nice break of "light and fluffy" reading for a change. (Shhh, don't tell my Professors!) Each month, they featured a unique place someone took their magazine. Due to weight restrictions, I could only take the cover of the magazine (What a hoot!) but here are the three photos I entered in their contest. Since my subscription will run out in October, I hope someone lets me know if one is ever published. It was fun! "Angel" Nathan's sweet mom actually emailed me and reminded me that we did meet at the NB conference in 2004. (That must be why I follow Nathan's story so closely.) Isn't she amazing taking the time to email ME in the midst of their horror?! We will continue to lift up her and her entire family with our prayers. Nathan's website is available by clocking on the red font on the last post. Today was filled with delays for poor grandma nee nee. We left the house very early to get her up to Toledo (1 1/2 hours) for her surgery; however, after waiting four hours after we got there, they decided that her leg is still too swollen so they sent us back home and we will go back and try again in a few days. Meanwhile, she's lugging around her leg - which has a 35 pound "A frame" brace going through the middle of it. The poor thing - we thought she was going to be staying so I never expected to have to try to get her in our house by myself. There was no way I could get the wheel chair up a few steps. (She came in on a gurney last week.) Finally, (Oh, she's going to kill me for sharing this.) we decided that if she scooted up the steps on her "backside" it would work. It was A LOT of effort, but we did it. Boy, am I grateful that little skinny, child-sized Christi could just be carried! This is all new territory for me!! We zipped back into town just in time for Shayla to get to her PT (Should I say "spa treatment? Looks pretty nice, eh?!) and to her horse riding lesson. She's doing so well her instructor says. It's been amazing to watch her growth this summer. I know Christi, a fellow horse lover, must be very proud too! Here's wishing you all good health and peace! Heaven's Newest Angel - Nathan G.
I found myself missing my dad so many times today, on the 11th anniversary of his death. Earlier this afternoon, I received an email post from Nathan's mom containing information that he had died. I could only cry to my dad and ask him to please be there for Nathan and to make certain he is finally out of pain and now ok. He suffered such a horrible death from this blasted beast. 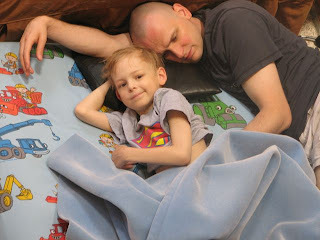 Our hearts are breaking for his parents, and most of his sister - Julia, who just lost her best friend. If you'd like to leave Nathan's family with a message of sympathy, you can do so through his caringbridge site by clicking "view and sign guestbook". While I never met Nathan or his mom, we emailed many times and I really felt like I knew them all. What a sweet, sweet family! August 2000: Christi & Shayla's first (and only) sack race. Christi 3, (far left), Shayla 1.5 (far right). Christi always enjoyed getting a few new things for school, especially school supplies. Thankfully, with garage sales and hand-me-downs, clothes were never a problem. I do remember buying two new outfits for her to launch her school career and then since she was diagnosed just ten days after starting school and she wore them to her hospital appointments instead. It made me so sad remembering how I bought them with joy thinking anxious she was to start school. "Christi & I always enjoyed school shopping together. Since I can't take her this year, I hope you'll use this money and have a fun day shopping with your daughter. It'll make us happy! Thank you! Love, Angela & Shayne"
When I approached Shayne with the idea last week, he said, "Why don't you call the parents and see if you can take the girls shopping. You loved taking Christi last year." (Long pause) "Oh, I guess doing this is hard enough, taking them would probably be impossible, wouldn't it?" It's hard to believe it was 11 years ago today when I received that dreaded phone call from my mom telling me dad had a heart attack. Shayne and I quickly threw a few things into a suitcase and took off for the 8 hour drive up to Silver Lake Michigan where I assumed I'd sit with him in a hospital room for a few days and slowly nurse him back to good health. Unfortunately, we weren't so lucky. I never got to talk with him in person again. Rest in peace, sweet daddy! I love and miss you! Thankfully, she remains in good spirits despite the pain. (I can even sing, "The Old Gray Mare Just Ain't What She Used to Be" and she just laughs!) Shayne continues to do twice daily dressing changes on her open wounds and he gives her the required shots. As we finally had a chance to talk while we drove yesterday he joked, "Well, I had a break from the medical scene long enough. I was getting bored and needed something to do before you had me start some home improvement projects or something." 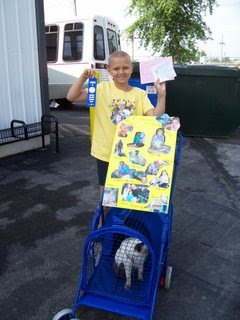 Some may remember last year while we were buzzing around Put-in-Bay (South Bass Island) on a golf cart, Nikki held a blogaton and raised a lot of money for neuroblastoma. She's doing the same again this year. Miss Christi will be the featured child at 10AM tomorrow, so please check in and blog if you'd like! THANKS, Nikki for the lovely tribute to Christi and others! A cure can't be found soon enough! Joan claims she's just like baby Jesus (no bed available for her) hee hee. Well, WE will always have a bed for her, so she arrived via ambulance tonight and we pray we can help keep her comfortable until her next surgery back in Toledo on Monday. As I watched them carry the gurney out of our home I couldn't help but think of how many times I worried about "them" carrying Christi's body out of our home. Thankfully, that never happened. I think this is the way it should be kids carrying for PARENTS, NOT the other way around. 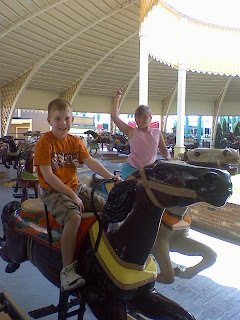 Taking Shayla to the County Fair one day this week reminded me of what a little socialite she is! I am amazed by the number of people who know her. Kids and adults would come up to Shayla, or pass by Shayla, saying, "Hi, Shayla!" and I would have to inquire, "Who was that?" It was precious. She really is a sweetheart and I am so blessed to be her mommy. I cannot imagine going on after the death of your child without having another sweetie to be responsible for. I am not at all indicating it's like a replacement, it's certainly not, but it does make me love and care for her all the more knowing how easily she could also leave us. The responsibility also makes you have to actually get out of bed each day, even when you think you cannot. Kids are so precious! This year, like so many others, we ran into one of Christi's best friends. This sweetie allowed Shayla to help her work in the barn, taking care of her 4-H animals (cows). Shayla, obviously, loved all of that and I found I had to go to the other side of the barn and call a good friend to chat. Christi had the greatest friends! How I wish she could have been there! I sometimes have people tell me, "She's in a better place," most likely trying to give me comfort. This makes me respond with a smile on my face and often a nod of my head; however, I am really thinking, "You've got to be kidding! There couldn't be a better place than in my arms!" I miss her so and as the one year anniversary arrives, my dread, anxiety and fear increases. I spoke with Dr. Vela about it yesterday, while he was examining Shayla. I must assume this is normal. Shayne must be exhausted from his late night travels home from Toledo, where he's been with his mom at the hospital after work. Today, she was to be transported to an assisted living facility where she needs to be for a week or so before her second surgery; however, they couldn't find any beds open. Hopefully, tomorrow they will find one for Grandma Nee Nee! Today, Shayla and I visited the cemetery. Regardless of what I hear and read about "time helping" it hurts and is very hard. Shayla also started her six weeks of physical therapy for her heel/foot. She had been complain for some time about it hurting, but we kept brushing it off. Finally, this morning I took her to the doctor where she was "diagnosed" with "Sever's Disease". (It's not really a disease at all and I am making light of the matter because in the United States 34 children were diagnosed with cancer today and THAT is a disease.) Shayla's minor inconvenience is because her bones are growing faster than her muscles and tendons. That is what has caused her heel to swell. We'll do ice/heat and exercises a couple times a day and she will be fine. Friday we will get the Xray and ultrasound results. We are so blessed! My prayers are with the 34 families who weren't so fortunate today! Yesterday, was an incredible one! Paw Paw and Nonee gave us the most amazing tour of the Amish Country. Shayla and I had been reading about the Amish so that we would be prepared for our visit. I think we were. We were able to tour two Amish homes and a barn - complete with many animals. We went on a buggy ride with a delightful Amish man and toured a cheese factory. We ate entirely too much and bought a few things at a bulk food store. Each year mom and Joe visit so I believe they knew the very best places to take us. I can't even describe the joy we experienced; it was delightful! I praise God for the wonderful Paw Paw and Nonee richly blessing us with their love. Making our trip absolutely incredible to me was the tour of an Amish school (one big room), along with a visit by a real Amish teacher (complete with her 8th grade education). According to Shayne, and my phone calls to the nurses, Grandma Nee Nee's surgery went well. We continue to pray for a a full and complete recovery. We know it will be a long road ahead. THANK YOU for your prayers. Shayla took her a stuffed animal from her bed and drew her eight pictures. That can only help, right?! You're mom-my's bright and shi-ning star. 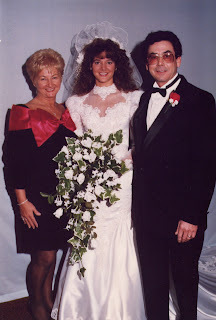 When I selected the above song for the "dance with my father" on our wedding day, I "thought" I knew and understood the meaning of the words. It wasn't until I became a parent myself that I fully realized how very true those words were. Christi and Shayla are "our little girls" who've blessed us with such joy - truly the light of our lives. While I danced with my father that night, he told me how he had heard the song on the Kodak commercial on TV and how he was so touched I selected it for our dance. He told me that all of his girls were the light of his life. With dad "always being there" I never imagined five short years later he would be gone. Today, on what would have been my father's 66th birthday, I find I miss him so very much. Dad died of a heart attack, while on vacation in Michigan, at the age of 55. It's hard to believe that was almost 11 years ago. Although my mom didn't want anything buried with dad in his casket, (I think she just really didn't want anything "tacky".) I wrote dad a letter the night before he was buried and we arrived very early at the funeral home so that I could get it to him without upsetting my mother. Writing that letter gave me a lot of comfort since I didn't get to say my final words to my father - like I was so blessed to do with Christi. Today, my mom and step father (Nonee and Paw Paw) will take us to the Amish Country, in Holmes County, Ohio. It is the largest population of Amish in the world. We all always felt that Christi would absolutely LOVE it there; however, it was yet another place that her carsickness would simply not allow us to attend. Today, Paw Paw will drive us throughout what will most likely be lovely countryside and I am certain I will wipe a few tears away as I miss Christi so much. I wish I could share it all with her, instead I'll look for "orbs" in our pictures to try to comfort myself. Yesterday, I mustered up the courage to take Shayla to the County Fair. More about that later. With Christi’s carsickness, there were certain places we would have loved to have taken Christi, but they of course were simply out of the question. Hocking Hills, located in hilly southeastern Ohio, was one of those places. For a very, very generous Christmas gift, our COSI friends and their loved ones, gave us a gift of a two-night cabin. With an “internet friend” we met through Christi’s journey flying into Ohio, we decided it was the perfect time to take advantage of this amazing treat! Sweet Jennifer, from Kids Cancer Crusade, was dropped off at our house on Friday and off we went to pick up Olivia who flew in from NYC. Soon we were experiencing gorgeous views and many hills, turns, curves and windy roads – nothing Christi’s tender stomach would have been able to handle! One of my “I’m the worst mother in the world” moments happened one year ago. We just bought our new van after our old one died. Christi was starting to get car sick as we were nearing our home. I pulled over and told her to get out and to walk. The look on her face was priceless as she realized I was serious. As she walked the short while, until her tummy calmed down, she kept tossing her head over her shoulder and looking at me. She had this “I really can’t believe she’s making me do this” look on her precious face. Now I tell myself I would love to have her “toss her cookies” in my van IF I could just have her hop her little body in there again! One of my thoughts as we walked out of CHOP about 10:30 on Tuesday, September 19th was, “We just bought a seven passenger van. We’re just turned into a family of three. We only need a little car.” One of my many thoughts as we made the journey down to Hocking Hills, with friends we never would have made without Christi leading us to them was, “I’m glad we have a seven passenger van.” With all of our camping and hiking supplies, we had it loaded! The cabin, complete with two bedrooms, a Jacuzzi, porch swing, living room, bathroom and kitchen was so much fun. I think we could have stayed for a few more days! Shayla LOVED the tire swing on the property and Jennifer and Olivia did a great job of pushing and entertaining her. We played many board games, went hiking and horseback riding. On Saturday night, we drove to Chillicothe where we watched the amazing outdoor drama “Tecumseh!” In preparation for our theatre experience, Shayla and I had checked out many books about him and the Shawnee and we made a quiz game for Shayne and the “big girls”. They were all good sports and hopefully, it allows us all the opportunity to learn a little bit more about the Native Americans. While we had difficulty getting cell phone service at times, on our four cell phones, Shayne was able to receive a call on Sunday morning informing us that his mother had broken her leg and was transferred to a Toledo hospital. We were soon on our way. We dropped the girls off and then drove up to Toledo to see how Grandma Nee Nee was getting along. Soon I noticed her nurse had a “tumbies” necklace on. She told me that she noticed Nee Nee’s necklace (Christi’s thumbprint) Saturday night and that they were surprised to find something in common like that. (Needless to say, I loved the nurse after that point. How could I not?) I wasn’t certain how I was going to feel in a hospital, but I think because I wasn’t seeing any children, I was fine and just wanted to try to get Nee Nee as comfortable as possible. Although in pain, Nee Nee was in good spirits. Her surgery will take place today and we appreciate your prayers. We know she has a long recovery in front of her. Shayla and I will soon go to one more “hilly place” I always wanted to take Christi, but knew I never could. We’ve been reading a lot about this place and the culture and people. I’ll share the details soon. One year ago, Christi wore the same outfit Shayla is wearing here, as went off to 4-H cat judging. I’ll never forget her excitement and happiness as she eagerly offered all of the information she had to share with a judge, very intrigued, amused and obviously very impressed with all of the information Miss Christi was telling her about the cat project. She enjoyed pushing Buckeye around and visiting with her friends. Two days later when I received an email informing us that Christi won best overall cat project and had a trophy waiting for her at the fair. She beamed for days! The trophy rests on her dresser in her bedroom. This week is the fair. While it’s most likely going to be quite an emotional challenge, I told Shayla that we would go one day because she wants to go see the animals. May God continue to give me great strength to do the things I cannot alone. 2000: Christi at Toledo COSI It may be hard to believe, but I remember this very day - sitting beside Christi while she completed an art project at Toledo's COSI. She was almost four years old (and she took the longest time to dip the sticks into the glue to create her art). She was so independent; it was precious! What I wouldln't do to have the opportunity to sit beside our angel again!! We will very soon be doing a few things we were never able to do because of Christi. NOT THAT WE MINDED AT ALL!! Soon we will be doing these things and I'll update then. The number of poems, written about Christi, we've received has been incredibly touching and comforting. Ideally, I'd share one here; however, since my computer has been "in the shop" since June 17th - and they're stored on there - I'm going to have to turn to a poem written for another child. Soon, hopefully tonight, I'll have my computer back - along with the many pictures I've wanted to share! Thank you everyone for your loving thoughts and kindess. We are so blessed! But she did not appear. I had been dreading this first visit to Cedar Point, one of Christi's most favorite places, since Shayne asked me to order the season passes last fall. I knew back then it would be difficult and I told him that I didn't ever want to go back there. He reminded me that Shayla loves it too - our whole family does - and that I should order the season passes because if you go about two times it's about the same price as having a pass. Reluctantly, I ordered our passes hoping that the first time back would at least be with Shayne or with a friend, NOT just Shayla and I - without Christi. I knew putting it off was only making it worse, so I called my sweet neighbor inquiring if they were interested in spending the day at Cedar Point. Only one of their children could go, and I'm so grateful Shayla's great playmate could go!! It really helped (I could not have gone alone.) and the kids had an absolutely wonderful time! I made myself push the memories of Christi at Cedar Point out of my mind because I felt myself choking each time I remembered something from one of the many, many times she was there - as a little one (age 2.1) on her first ride (the motorcycles in Kiddy Kingdom, yes I remember) to last year on our very last trip - with Jennifer - when the "big girls" went to ride some of the "big" rides to the many trips I enjoyed with Christi in between. It only seemed right, last fall, to bury her with her Cedar Point Season Pass. I tell myself she's riding the greatest rides of all in Heaven. It's been nice just being at home this week. Shayla was able to spend some time with her cousin, Shelby, and she is loving playing with the sweet neighbor kids. I've been putting the final touches on the grad class I'll start teaching for Heidelberg on Monday. 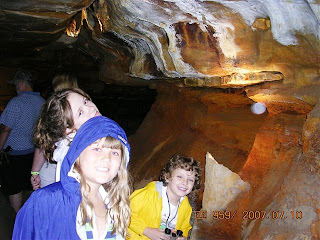 We did go with Grandma Nonee and Paw Paw to the Ohio Caverns where we met up with my sister and two of the three kiddos. My mom only took one picture before her battery died. While none of my photos had any "orbs" in them, I thought it was great that it had an "orb" in it - perhaps Christi was enjoying the tour with us too! I think I'm about to do something this afternoon I've really been dreading. I'll let you know how it goes, if I really proceed. On Sunday, I had my teachers' meeting from 7 - 9:30 AM and then we drove up to NYC to spend the afternoon with John, six weeks after Penelope's death. It was great to be with another parent who knows and understands how we are all feeling and without a doubt we could feel his pain too. As his little guy and Shayla enjoyed Central Park, including the Petting Zoo, he showed us the lovely magnolia grove. This is close to the Balto statue Christi & Shayla loved and this grove will be dedicated in Penelope's memory in September. Although our visit seemed so very short, and we wished we would have been able to meet up with other NYC friends, we knew we had a long drive back - and that we've been telling Shayla we will be going back for a few days later this summer so she can get together with Veronica and we can see more friends. On Monday morning, I had a meeting from 7AM to 9AM and then a break until 11AM so I hopped into the rental car and we raced over to the UPenn Animal Hospital where we were to make a little presentation. We knew it would be hard, but we were surprised that it was much more difficult than we ever imagined. Those sweethearts at UPenn's Animal Hospital will never know how much joy they gave Christi - and our entire family - as a result of opening their arms to our little "vet wanna be". They also took Shayla for an entire day while Christi was dying as it wasn't much fun for Shayla to be in the hospital with us during those dark days of feeling helpless. We all received another tour, as tears kept falling for me, knowing it'd be the last tour I'd ever take and remembering Christi's love for animals and excitement at seeing the: blood donor cats, kidney donor cats, dogs getting their chemo, (No I'm not making this up!) and of course the surgical wards and emergency areas with the sweetest of employees. We presented the engraved plaque, containing Christi's picture with one of their doggies with a broken arm, and told them that we wanted to set up a long term program of some sort with some of the Christi Thomas Memorial Fund because we thought Christi would really want that to happen. They amazed us by asking us where we wanted her plaque hung and by together deciding that we'd support the existing "Vet Pets" program at the Ronald House, since that is where they first met Christi. They told us that it will be named the "Christi Thomas Vet Pets Program" and that her fund monies will be used to pay for the film. They take Polaroid photos of the kids with the animals at Ronald and give them to the parents. I know I'm the "picture queen" however, I know that I'm odd and most parents do not have these special pictures of their kids so I feel very glad about that. Additionally, this program is great for the siblings also staying at Ronald, not just the "sick kids". It will also pay for the special training the vet students' pets have to go through in order to be accepted into the program. As you may remember, Christi said she was going to "UPenn!" for her second college, because she wanted to become a vet there. Of course she said she was going to take her pets to college with her like the vet students did and we believe she may very well have volunteered each week at the Ronald House by taking her animals over for the kids to play with. Regardless of the emotions of the morning, it was incredibly kind of them to be so accepting and loving. Next we walked to CHOP; the same jaunt we made with Christi in her blue stroller countless times. As I held Shayne's hand nearing the hospital I found myself squeezing it and thinking back to John's words the day before, "If you can walk into CHOP, you are really brave people." I kept thinking, "I'm really not brave. Why are we doing this? Didn't we just leave her little lifeless body and walk out? I can't possible go back there and bring all of that back up? I'm feeling ill just seeing the building." Yet I knew it was important to try to help with our healing and that I really did want to see some special people there, even if we had agreed ahead of time that we would not go up to the floor because that would just be too hard. Our sweet social worker, Dana was there and it was great to see her! She made nearly all of our Ronald House reservations and listened to me cry many times and who literally ran around University City trying to find Christi some cookies when she wanted them and the cafeteria was closed. Such a sweetheart! Later, I learned from her that it was also difficult for her to see us. She and Christi certainly shared a special relationship and we were one of the first families she started working with in her job. Dr. Maris soon met us in the lobby, despite his busy schedule. We gave him big hugs and it was so nice to see him too. Of course with Dr. Maris you have to have "serious" conversations too. We learned from him that the institutional review board did not want to name Christi's cell line FU-NB-06. They suggested CHLA (Children's Hospital Los Angeles) and a different number. Dr. Maris said that there were many email exchanges between Dr. Reynolds at CHLA and the Board, but thankfully Dr. Maris and Dr. Reynolds stood their ground by informing them that anything else would not be acceptable to Christi's family so FU-NB-06 it was!! He also told us that no one had ever done that before and since we did that with Christi, two other families - in our same exact situation, took the cells from their dead children and hopefully they'll be as successful in establishing new cell lines. Shayne told him that we wanted the cure to the beast discovered, but we wanted to make certain it wasn't with anything currently available (anything we could have tried on Christi, but didn't). He told us he was certain that that won't happen and that we did all we could. Shayne dropped me off and Tim picked them up to go "down the shore". My thanks to Tim for putting up with Shayne and Shayla for a few days (Smile) while I was in my meetings. It sounded like they all had a really great time together! I was fortunate to meet up with two of the sweetest Ronald Volunteers on my lunch break on two different days. While I wondered how difficult it was for them to come and see me, I was very glad that they did. I knew I couldn't possibly return to the Ronald House, a place we all loved so much, but I really wanted to say hello. I later told Shayne about the great lunch dates I had, "If they lived near us, I bet they'd be some of my closest friends." I'm still stunned by the amazing people Christi introduced us too! The amazing Grants held another Alex & Christi lemonade stand this year. Where in the World is Shayla? 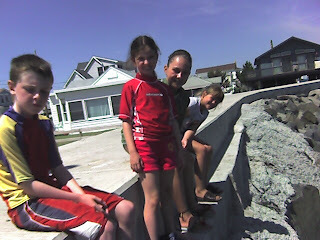 Shayla enjoyed being at "the shore" in New Jersey with her sweet Philly friends. New Jersey, Pennsylvania and New York (Plus a few minutes in Delaware when we missed our exit back to Philadelphia after our quick run up to NYC).Photos from Thursday's entry: "down the shore" (Wildwood, NJ), eating a Philly cheese steak and Philly pretzel in University City (PA) and watching the carriages go by in NYC's Central Park (NY). Some very sweet bloggers are also excellent guessers!! Thank you so much for blogging back and emailing your responses. Shayla was squealing with delight and giving comments, "Wow! They're really close." "Oklahoma? No way! They're just joking!" reviewing each of the sweet responses, thank you! And today Shayla received a little taste of her own medicine; it had us both laughing! A a sweet little blogger (Christi's age) emailed a picture for Shayla to guess where she was last week (South Beach, Miami) too fun! Thank you so much for all of your kindness and interaction!! Since we just returned home from visiting three states in six days, (actually, make that four, we missed an exit and visited a 4th state one night, hee hee!) Shayla is hoping you may again be willing to guess where we went. I told her that she'd have to select pictures with good clues of the locations because what she selected last time was just too hard. Please let us know if you can guess the three states! Thanks! Tuesday, June 19, 2007: Today we drove for two hours and then we got to the airport. We had to sit on the plane for a little bit, but then the plane took off. For an hour I read Christi’s, “Dr. Amelia’s Boredom Survival Guide”. Then I played Gameboy for a bit. A boy came and sat with me. The flight was almost seven hours long. When I woke up we were in Anchorage and we went to the hotel where we met Aunt Marty and Uncle Jeff. I slept on a roll away bed. Wednesday, June 20, 2007: Today I rode on a train. I saw a moose, doll sheep and a lot of bald eagles. The ride to the ocean was 2 ½ hours. There was a glass dome where we got to sit. Next, we stood in a long line. Then we got on the ship. I got my finger stuck in the balcony door. It hurt. Then I went exploring the ship with my dad and then with my mom. We played a lot. Thursday, June 21, 2007: Today we rode on the ship the whole day. First we swam. The pool had ocean water in it. The pool was hotter than the hot tub! Then we want to waltzing lessons. I danced with my dad. Mom helped my dad dance. Next we went to high tea. I had a scone and a sandwich and a doughnut. Then we met our waiter for the week. Then we ate. I had steak. Then we went to a show. Then people danced and dance different music. I love the shows! Then we went to bed. I found three chocolates on a pillow. Friday, June 22, 2007: Today I got to go to Sitka. There was kayaking. We saw star fish and seals. It was beautiful. Me, my mom and dad kayaked all together. A seal named Lou-Seal, was really close to our kayak. We ate chowder. Then we went to meet some friends who live in Sitka. We saw a dig and lots of totem poles. We went to The Raptor center. Our friends showed us their house and dogs. They drove us around the town. We went back to the boat and ate dinner. I had steak. Dad and I played chess with big pieces on the boat. So far, I have five and dad has two. Saturday, June 23, 2007: Today we rode a bus to a station. There we got into a helicopter and it was fun. We flew over Juneau and saw glaciers. It was cool. Then we arrived on top of the glacier where everything was white. It was the dog sled farm. I got to do the demonstration to show how to be a musher and work the sled and how to sit down. Then I drove the dog sled with eight dogs for twenty minutes. Mom drove a little bit when I rode. Then the helicopter flew us back. I went to the kid’s playroom for four hours while mom and dad and Marty and Jeff went hiking. Then I played chess with dad and I won. Sunday, June 24, 2007: Today I rode in a bus with my family for two hours into the Yukon (Canada). Then went horseback riding. My horse’s name was Spirit. Dad’s horse was Trooper and mom’s was Jade. We rode up a huge mountain and looked over Emerald Lake. It was fun to go up and down the hills. We went back to the ship and ate dinner. I had steak. Next we all went to a show again with dancers and singers. It was fun. I took a shower. It's the size of a chair. I had a good day. 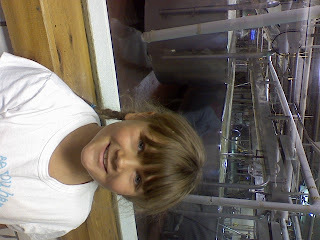 Monday, June 25, 2007: Today we went to Ketchikan. We didn’t have any plans so dad rented a fishing pole and we fished for one hour. Our bait was fish eggs. Then I went to the kid room on the ship to play with my friends. My parents went on a hiking trail. I got my face painted like a dog. Our two counselors had a fake wedding. I was one of the brides’ dogs. Then I saw a show with the camp Carnival kids. Next I went to eat dessert with my mom and dad and aunt and uncle. Next, I saw the show again this time with them. It was the best show! Tuesday, June 26, 2007: Today I went to the kid room and got my face painted again. Then I went with mom to the library where we read and played Battleship. Then we sat in the hot tub. Next dad took me swimming for an hour. We met mom for high tea and I played Battleship with her again. Then we went to another fancy dinner. I ate steak. I like the fancy dinners. I got to dance with the waiter to “Hey Baby”. We saw another good show with dancers and singers and went to bed. Wednesday, June 27, 2007: Mom said she wanted to stay two more days. I said I wanted to stay two more years! We got off the ship in Vancouver, BC and went to a hotel. The hotel had free bike rentals. I rode a tandem. I had to pedal. It was fun. We went on a long bike ride and then ate dinner in Chinatown. We sat in the hot tub on the roof top! Shayla loved this "art car" driving around Vancouver. The driver even gave her a souviner - little plastic car parts. She took great delight and I believe made his day! Thursday, June 28th, 2007: We went to the airport and stood in long lines. Aunt Marty and Uncle Jeff were there. Their flight got cancelled. Our flight was five hours. I read and played Gameboy. Dad drove home and we went to McDonald’s and got home at night. Grandma Nee Nee and Laura took care of my pets. I am glad to see my pets. Buckeye meowed all night she was so happy to see us. Thank you, dearest Shayla for suggesting a most incredible vacation destination. You are a gem - a rare and precious find and I am so blessed to be your mother. Just like your sister, you are an excellent traveler - always making the best of "bumps" that come in the road and always with a beautiful smile and great attitude! I am very lucky!! Thank you very much to all who "played along" with Shayla's little guessing game either by posting or emailing your guesses. Shayla had a ball, learned a bit about geography and even got some new vacation ideas. Gee, thanks - hee hee! ANGELA'S MOST TREASURED MOMENT: During our dog sled adventure, I was sitting in the seat while Shayla was being me being the "musher". Our guide asked her if she'd like to send them running and she said, "YES!!!" He told her to say, "Hike!" In her little tiny voice she squeaked, "hike". Two of the dogs right in front of me jumped to all fours and dug in. The other six in front of them turned their heads back as if to say, "What was that?" SHAYNE's FAVORITE QUOTE: Follow Fawn through the woods. (Our "sister of a friend" who lives in Sitka met up with a friend named "Fawn". She lead us to where some college students were participating in a dig. Shayne thought it was so funny......follow "Fawn" through the woods.